A Path To Lunch: The Cinque Terre Express Train Service Begins. 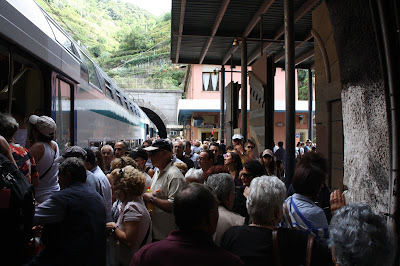 The Cinque Terre Express Train Service Begins. The '5 Terre Express' Train Runs Every 30 Minutes to All Five Cinque Terre Villages. Stops: La Spezia Migliarina, Centrale, Riomaggiore, Corniglia, Manarola, Vernazza, Monterosso, Levanto. Just in time for the long Easter weekend in the Cinque Terre, the new "Cinque Terre Express" train service begins Saturday, March 26, 2016. Operated by Trenitalia Regionale with support from the Region of Liguria, the new service will enhance transportation options to the famous five villages comprising part of the Ligurian UNESCO World Heritage Site. There will be 44 daily trips in both directions between Levanto and La Spezia Migliarina Station* every half hour with intermediate stops at La Spezia Centrale, Riomaggiore, Manarola, Corniglia,Vernazza, and Monterosso. Trenitalia Regionale Liguria is to provide reception, information and assistance to passengers, and enhanced 'customer care' during busy times. For 2016 the new 'Cinque Terre Express' train will mean much less crowding. In the first phase of the service, fares will be kept unchanged at the current rates for all, both residents and tourists. The "5 Terre Express" will remain active until 1 November and will benefit both commuters and tourists with less crowded trains. It is expected that La Spezia's many cruise ship passengers travelling to the Cinque Terre will be boarded at Migliarina Station, thus relieving congestion at La Spezia's Centrale Station. * Traveler beware. We visited Migliarina station on May 30, and there was no notice on the schedule board or other signs about CT trains. There's also no one to ask, as there's no ticket window. 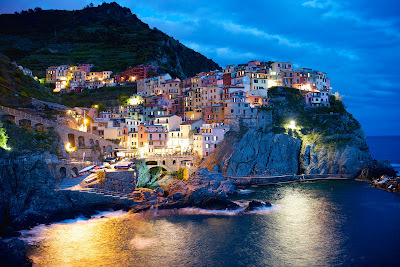 Where to Stay to See Cinque Terre? Use a pretty Ligurian town nearby as a base to see Cinque Terre. We describe all the Pluses & Minuses. Your reservations support this site. Our links do not affect prices. Thanks for helping us help travelers.